A wealthy Irish lady and man about 1600. 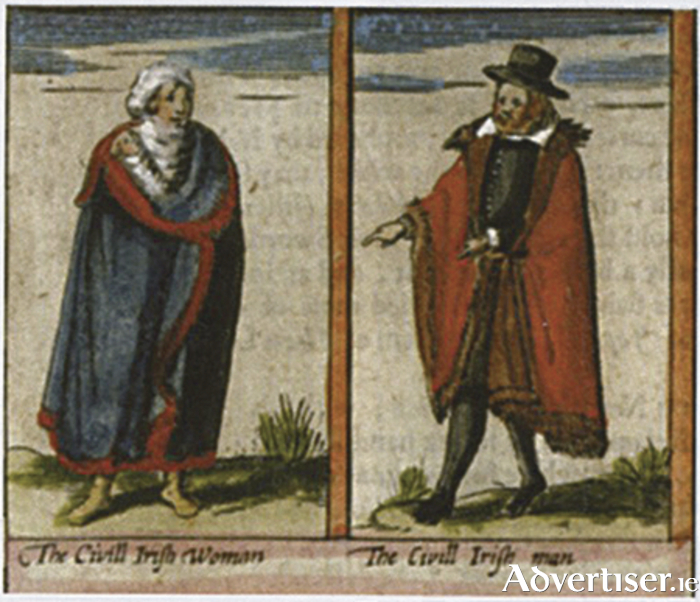 The lady wears her brát or mantle, in Galway blue; while the man appears to have adapted his mantle to allow his arms free movement. (From The Tribes of Galway by Adrian Martyn). OK. No one knows exactly; but what was the ‘must have’ garment for women of that period.That was exported in its thousands from Galway port; was all the rage in continental Europe, and was even worn by members of the English royal family? It was the humble but very practical Galway brát or mantle. This was an all-body outer garment, certainly lined with wool, that could be pulled tight around the body in cold, wet, weather; or worn loosely in milder times. Variants included a poncho-like fallaing, and a leather cochall. It was regarded as part of the Irish national dress, which continued to be used for at least two centuries. Fur-lined mantelles de Hiberniae were in high demand in medieval Britain. Waist-length half mantles appear to have been made specifically for Continental export. Their popularity abroad was of long standing. Irish merchants sold them in Cambridge markets as long ago as the 960s. The English army adapted the garment for its own use, the Pope’s agent bought supplies to sell in Italy, and the early Tudor kings and queens of England would hardly leave the warmth of their great fires without wrapping themselves in a Galway brát. We can see from the the cut stone, tall, buildings that survive, the elaborate stone carvings, marriage stones, and the evidence of a well laid out town, that Galway was once a wealthy and busy place. Its wealth was achieved not by wars of conquest but by the hard graft of trade. Galway was noted as ‘a town much frequented by foreign businessmen’. Its merchants described as ‘shrewd managers of the wealth they have accumulated from trading’. Many of them were ‘rich, and great adventurers at the sea’. The Galway mantle was only one of many items exported. Galway Bay and its harbour teemed with boats of all sizes plying their trade to Bristol, London and Southampton; Bruges and Sluys (Flanders ), Lubeck (Germany ) Calais, Dieppe and Rouen (Normandy ), Morlaix, Nantes, and St Malo (Brittany ), La Rochelle, Bordeaux (Gascognie ), Bilbao, Lisbon, San Sabastian (Iberia ), and later the West Indies. By the 1540s the majority of Ireland’s export trade to England, consisted not only of fish, hides, wool, and meat as generally assumed, but also manufactured goods such as the brát. Returning ships brought wines and brandys, tobacco, coffee, sugar and spices which were sold throughout Ireland for good profits. Bringing ashore such cargos along the piers of Long Walk and the docks would have filled the air with exotic aromas. All this wealth, was mainly in the hands of the main 14 families, or Tribes, of Galway, to whom I will refer next week. They were loyal to the English crown; paid handsome tax revenues, and had privileges as a result. Initially they kept the Irish native contemptuously outside the walls of the town. There were often skirmishes, and worse between the two societies. But as time went by, more native Irish shared in the adventures of the merchantmen, and sometimes their wealth. But London was far from Galway and it was obvious to the Tribes that it would be a more practical policy to make friends with the natives. A wonderful opportunity arose when the one of the members of the fearsome Clanricard family, Uilleag na gCeann a Búrc, a merciless Gaeilgeoir warlord (who had made the Tribes’ life a misery if any ventured into or near his lair around Loughrea territory ), petitioned the mayor of Galway for the hand of the fair Marie Lynch, one of the most powerful Tribal families. How the couple met and fell in love is a mystery, but poor old Uilleag na gCeann was smitten (incidentally, the ‘na gCeann’ refers to his preference to cutting off the heads of his enemies ). The marriage was agreed on condition that Marie would teach Uilleag the King’s English, the King’s laws, correct forms of Anglo-Irish dress, and table manners, all marks of English civility. Readers will not be surprised to learn that, as wives fail today to teach their husbands civility, Marie failed to put manners on love-sick Uilleag. Even so, the marriage was a success to a point. On a visit to London in June 1543, the couple were presented to King Henry as an example of what love could achieve. The King had his own challenges finding a wife. Nevertheless he was charmed. He immediately made Uilleag na gCeann the earl of Clanricard, and the title was to pass on to their son, who would be a loyal subject, and Galway’s good friend. Alas, on his deathbed, it was revealed that dear old Uilleag had previously married Gráinne Ni Chearrbhaill of Éile, who was still very much alive.The marriage to Marie was annulled. Next week: The Tribes thrive in ‘Connacht’s Rome’.